Sauze - condolences from all your C&V pals on the theft of your bikes. Aside, here is an offering on eBay. It is the first truly NOS item I’ve seen. New Old Stock! been in the box since 1979! Rare color "Super Grand Prix" made by "Raleigh in England"!! Still in the original wrapper with owners manual still attached! Oh yes in mint condition! do not see any nicks or scratches or damage! Just needs some light cleaning (that will be fun!) and assembly and you will have one of the nicest road bikes in the world! Comes with orig box too! I was told this is a high end bike with hand made frame and very collectible. I am not an expert on these so I posted lots of large pictures! ----- Starting out low with NO RESERVE! so bid to win! 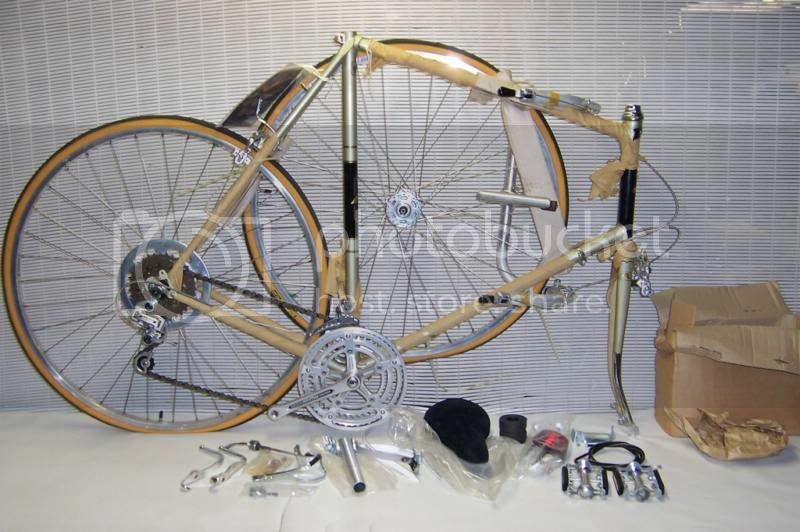 Where else can you get a brand new over 30 yr. old Raleigh bicycle made in "Birmingham"? ----- Email with any Q's ----- Very careful packing of the original box put into another box USA will be $75.00 fedex ground oversized rate on east coast and $95.00 west coast. ---- We will ship to Canada and UK in two boxes, priority air mail, email for rate. ---- Be sure to check out our other auctions and 100% feedback too! This is the bike my Wife bought for me as a birthday present. I showed her the ebay listing and mentioned how nice it would be to have an NOS bike. She's great....wife is too.